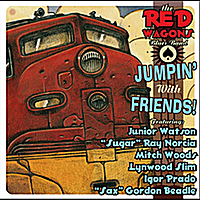 All the way from ome (IT), The RED WAGONS recreated the classic sounds and rhythms of '40 and '50 R&B in an explosive mixture of boogie, jumpin' blues, early rock'n'roll and swing. 8 years after our first album "ULLALLA BOOGIE" and after having crossed the lenght and breadth of Italy and Europe, we came up with the idea of this record. Why not produce a CD that witnessed the artistic collaborations among many "friends" of the blues? moments and in various studios with Junior, Ray,Lynwood,Gordon, Mitch and Igor among others.Those who practice this kind of music know that Blues does not develop in the seven notes only, but also within the soul of its musicians, who trough respect and iinvolvement, are able to create a sort of brotherhood. All the great artist in these recordings have SHARED with enthusiasm the making of this project, building a wonderful relationsship sublimed in the dark and joyful notes of these recordings, along with dinners and entertaining conversations. We have put out a record whose sound travels to the full and complete re-appropriation of a genre that has always been on the crest of the wave and can be identified with pop music itself. Our secret wish has finally come true.